The MCC community has saved nearly 250 lives! This is our 14th blood drive during Jumu’ah. Each blood drive has always been fully booked or near-fully booked! 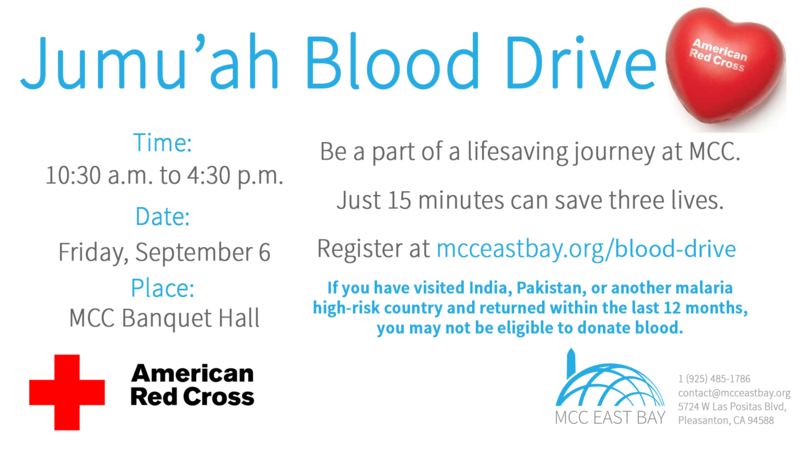 Let’s continue that trajectory at this Winter blood drive and keep all our American Red Cross guests busy when they setup in our Banquet Hall from 10:30 a.m. to 4:30 p.m. on Friday, September 6, 2019. If you have visited India, Pakistan, or another malaria high-risk country and returned within the last 12 months, you are not eligible to donate blood. Every person who donates blood at MCC in 2018 will receive a voucher for either a free haircut at Super Haircut in San Ramon, or a free oil change at Midas and SpeeDee Oil Change in Dublin, or a meal at Burgerim Gourmet Halal Burgers in Pleasanton. These vouchers are generously donated by a MCC congregation member to encourage participation. MCC Youth: If you are 16 to 18, here is the link to the donor requirements and parental authorization form. On the morning of the blood drive, please complete the Rapid Pass online and bring the print-off with you to speed up the check-in process.